Welcome to the Memorial Day edition of the Art & Science of Active Trend Trading! Be on the lookout for some fantastic new announcements and offers from Active Trend Trading going into June. We will do our formal launch of more trading features for both basic and premium subscribers. We will continue to focus on great trades for both Income Generation and Capital Growth as we move into the summer months. General Market Observation: The Indexes this week provided some constructive price action, but volume was lackluster. The SPX pushed to a new closing high and the Nasdaq regained it’s 50 day and 100 day moving averages after breaking out a triangle pattern. The Russell continues to lag a bit but also broke through a down trending resistance line. All three of these events took place on Friday in light pre-holiday volume and knowing that pre-holiday trading sessions tend to have a bullish bias brings some skepticism into this weekend review. One thing that I’ve observed during this week’s move to the upside, the stocks moving up with increasing volume due to institutional buying are still being overshadowed by the selling volume of stocks being sold by institutions. The top stock RXN being bought by institutions on Friday showed an increase in buying volume of 86%. Compare this to the top stock being sold by institutions; URUN had an increase in selling volume of 622%. I believe this speaks to underlying weakness that may continue to be an issue through the summer doldrums when the market tends to drift lower. Clearly this week was bullish on all Indexes, but be on guard for weakness and what happens after it pulls back from the next swing high as each of the Indexes approach strong resistance zones. Lastly, never argue with the price action even if it is happening with weak volume! See charts below. Outs & Ins: No new stocks were added to the IBD 50 this weekend but 7 stocks left the list and were replaced by stocks that have appeared on the list earlier in the year. There was an improvement to the character of the list this week with only 4 stocks on the list currently living below the 50 day moving average. One of the benefits in using the IBD 50 list is the thumbnail chart provided in Monday and Wednesday edition of the paper. For real busy people who simply want to trade the breakouts, these thumbnail chart will list which stocks have defined buy points. One can then simply place a conditional order at that Action Point and then wait. The other rules of a 7-8% stop loss would apply and an upside target of 20-25% which can also be handled with conditional orders. Two IBD 50 headliners will announce earnings during this short week they are KORS & QIHU. Many of the stocks on this elite list provided very constructive price action this past week and but are extended from proper entry Action Points. However much like the Indexes this constructive price action was accompanied with below average volume. Below average volume tends to dim the bright light of enthusiasm from the move a bit. I’ll be watching BIDU, GMCR and VRX this week for potential entries which may occur towards the end of the week. Off the Wall: The Memorial Day National Holiday is always tough when it comes to wishing someone well. When one understands the significance and meaning behind this day of remembrance to say have a “Happy Memorial Day” doesn’t really hit the mark! 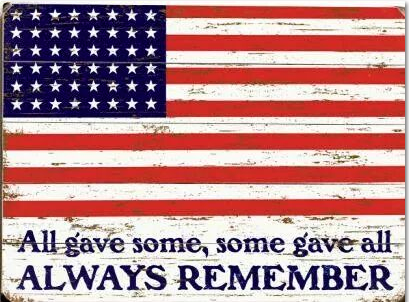 It really isn’t a day to be happy but a day to remember and be thankful for the ultimate sacrifice men and women in our arm forces paid to preserve the Freedom & Liberty that make America a special place. We must never lose sight of those who died both known and unknown defending America. Our birthright as Americans is a reality because of their sacrifice. They cast aside personal safety and security to serve and paid the ultimate price—their lives. 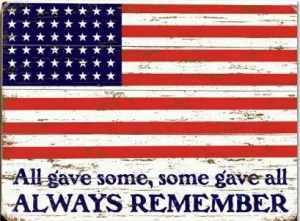 Let us remember and place a higher value on our birthright of freedom and liberty and never relinquish this gift just so we can be taken care of and gain a false security.